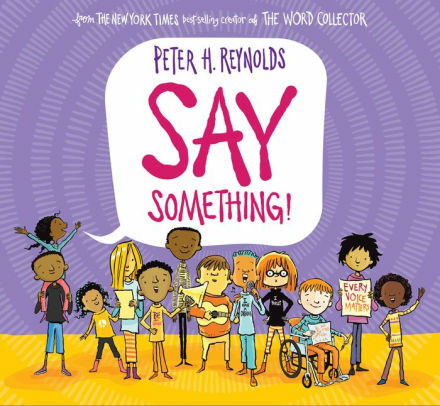 In this empowering new picture book, beloved author Peter H. Reynolds explores the many ways that a single voice can make a difference. Each of us, each and every day, have the chance to say something: with our actions, our words, and our voices. Perfect for kid activists everywhere, this timely story reminds readers of the undeniable importance and power of their voice. There are so many ways to tell the world who you are... what you are thinking... and what you believe. And how you'll make it better. The time is now: SAY SOMETHING! Peter H. Reynolds is a New York Times bestselling author and illustrator of many books for children, including The Dot, Ish, I Am Human, Happy Dreamer, The Word Collector, and his forthcoming picture book, Say Something!. His books have been translated into over 25 languages around the globe and are celebrated worldwide. In 1996, he founded FableVision with his brother, Paul, as a social change agency to help create "stories that matter, stories that move." He lives in Dedham, Massachusetts, with his family.